The House of Representatives election in Japan on 14 December resulted in a comfortable victory for the incumbent coalition government parties. The Liberal Democratic Party (LDP) and the New Komeito party won, in aggregate, more than two thirds of the total 475 seats. The LDP retained 291 seats, a decrease of 4 from the number it won in the landslide of December 2012. However, out of 8 Independents elected, about 4 seem likely to align with the LDP. In view of the 5 abolished rural seats where it had been dominant, the LDP will see its position as essentially unchanged. With the Japanese economy weak and the forced resignation of two female ministers—they resigned in October over the inappropriate handling of their publicly-subsidised political funds—Prime Minister Shinzo Abe seemed to be losing political steam, just as he did in his first government in 2007. Then, in November, he suddenly dissolved the House to seek the voters’ judgment about a postponement of the proposed lift of the consumption tax rate from the present 8% to 10%. Abe could have easily foreseen a challenge to his leadership from inside the party, if the LDP’s ranks had been significantly reduced despite retaining government. But he won the gamble. In the LDP world, the number of seats counts. Especially after the 2012 landslide, retaining the status quo is a big result, with more than one hundred of its first termers returned. So Abe’s likely to remain prime minister for the next four years. That means all the security initiatives implemented under the second Abe government such as the first National Security Strategy since 1957, the National Defense Program Guidelines for FY 2014 and beyond, the relaxation of the Three Principles on Arms Exports and the constitutional reinterpretation of collective self-defense, will remain intact. The revision of the Japan-US Guidelines for Defense Cooperation that is planned to be introduced early this year will also go on, to broaden the scope for Japan’s Self Defense Forces cooperation with US forces. Most opposition parties did not raise those security policies as electoral issues, apart from the Japan Communist Party (JCP) which increased its number of MPs from 8 to 21 after presenting itself as the only viable anti-government critical force. The Japan Social Democratic Party stayed largely silent about foreign policies and just retained its incumbent 2 members. The Democratic Party of Japan (DPJ), the largest opposition party, opposed the notion of constitutional reinterpretation through cabinet fiat claiming it infringed the principle of constitutional amendment through due process. That differentiation from the LDP might be largely rhetorical, because the DPJ subsequently vowed to defend Japan’s sovereignty in a determined manner. On the other hand, the LDP’s foreign and security policy manifesto confirms the Abe government’s commitment to the ‘Proactive Contribution to Peace’ by strengthening cooperative relations with likeminded countries such as the US, Australia and ASEAN. (That might be the first-ever example of Australia’s name being specifically mentioned in any party’s official electoral document.) It further promises to improve relations with China, Korea and Russia, while revealing a determination to tackle challenges to the ‘rule of law’ especially in the South and East China Seas. It goes without saying that there’ll be no change in the relaxation of the arms exports principles, as they effect Australia’s security policy. It’s noteworthy that no major political party mentions that matter—with the exception of the JCP, unrepentant in the strength of its objection. Problems over the transfer of submarine technologies will likely be handled in a modest but steady manner. With regard to another important security issue, though, it should be pointed out that LDP candidates were defeated by non-LDP candidates in all four electoral divisions in the Okinawa Prefecture. That indicates how indignant the Okinawa people are about both the US bases and the central government’s indifference to their opposition. The Abe government will face a rocky road over the transfer of the Futenma US Marine base to the alternative site on the eastern coast of Okinawa Island, with the newly-elected conservative but anti-US-bases governor in office. Still, another extraordinary development has emerged as a result of this election, at the other end of the politics. The Party for Future Generations (PFG), which fought the electoral campaign with an unequivocal promise for drastic constitutional change, finds itself represented only by two traditional members who had cultivated a deep-rooted electoral support base since the LDP days. The party couldn’t secure sufficient votes to win seats through proportional representation, so even the once-popular politician, Shintaro Ishihara, lost his seat. Ishihara, then Tokyo Metropolitan Governor, invited preemptive nationalisation of the Senkaku Islands by then DPJ Prime Minister Yoshihiko Noda in September 2012, causing the current deadlock in Japan-China relations. 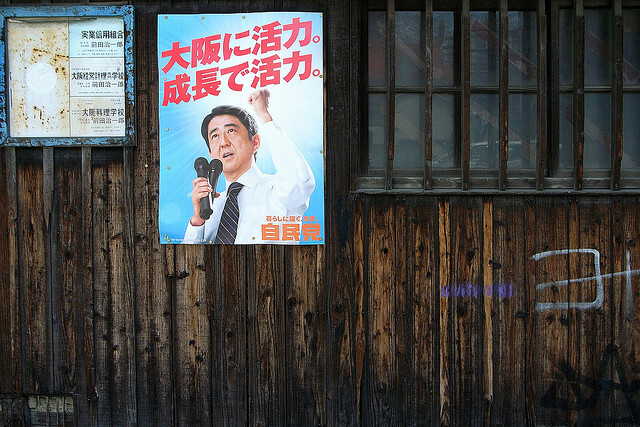 PFG marginalisation suggests Japanese voters are fed up with excessive nationalist claims driven by populist sentiments. The Abe government seems likely to become more restrained about its nationalistic trends. In that sense, it will have returned to the traditional, authentic LDP line of pragmatism and flexibility. Yes, the LDP officially promised constitutional changes this time around, but its specific commitment is confined merely to cutting the electoral age-qualification from 20 to 18, to bring it into line with the electoral age for constitutional referenda. That’s a comically modest manifesto. Fed up with the political inertia under a long term of one-party rule by the LDP, Japanese voters elected non-LDP coalition governments in 1993-94 under which the political reform bills were enacted to introduce the present single-seat electoral system in the House of Representatives. Japanese politicians responded to the public’s expectation for revitalised politics with populism. That resulted in three successive electoral landslides in 2006, 2009 and 2012. After two decades of political turmoil, Japanese voters seem to have selected stability over volatility. Now the onus is on Mr Abe to sail the troubled waters with a steady hand. Teruhiko Fukushima is professor of the Department of International Relations, National Defense Academy of Japan. Image courtesy of Flickr user m-louis .